Wunder Radio develops and iPhone / iPad universal app that lets you listen to thousands of radio stations from around the world. The app loads over 50,000 Internet radio stations and other audio streams, so you’ll find your local station or explore new ones from around the globe. Wunder Radio runs in the background using the new iOS 4 multitasking feature, and has a friendly user interface with a search box that you can use to find what you want quickly. On the Stations tab you see a list of pre-created search options or you can type keywords if you already know what you want. Here you’ll find Recently Played, Local Radio by GPS, Browse by Sports/Talk/Music/World/Location/Presets. Scanners section lists stations by ScanAmerica.us, LiveATC, RadioTime Scanners, and RailroadRadio.net stations. 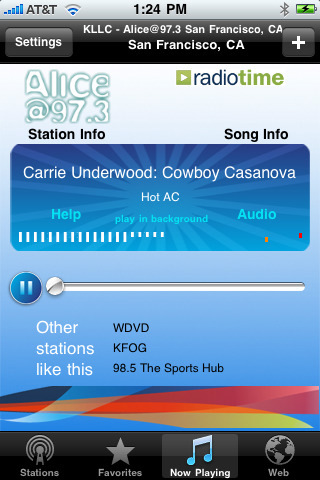 Subscription stations are also supported for Sirius and XM subscribers. Other directories provided are radioio 2go, icecast, Internet Archive, 8tracks, and TUNED.mobi stations. Given the overwhelming large number of station, you can save your favorites and get to them quickly later from the Favorites tab. The now playing tab shows your active playing station along with a list of “Other stations like this” which is a great way to discover new stations. There is a built in web browser in the app as well for uninterrupted browsing. Streams supported include mms, ASX, M3U, PLS, XM, Sirius and many others. You can also find and listen to recorder content on-demand using the radio archive footage including coverage of significant historical events. You can find and list songs you’ve listened to, and get your local NOAA weather radio streams, emergency scanner streams and local railroad information. The app works on both the iPhone and iPad, and is a great buy if you’re looking for a radio app that supports a loads of online stations. Its user interface could use a boost. Overall, Wunder Radio is very content rich and definitely worth checking out when considering a mobile radio app and great for hearing music, news, weather and sports updates on the go. 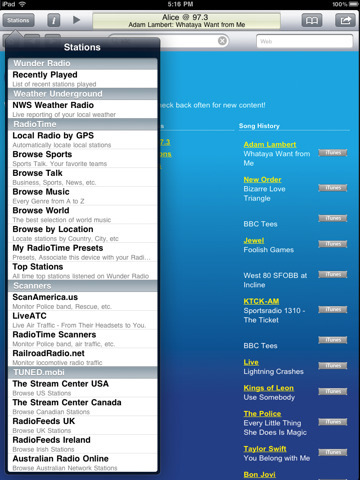 AppSafari review of Wunder Radio was written by Joe Seifi on August 29th, 2010 and categorized under App Store, iPad apps, Music, News, Radio, Universal. Page viewed 8029 times, 1 so far today. Need help on using these apps? Please read the Help Page. I had my app for more than 3 years but for a mistake I delete my app can I recover or get back my original app?